So what gets us excited about an ex-library paperback book with a separated rear cover, no front cover, and a badly worn spine? Normally, nothing. 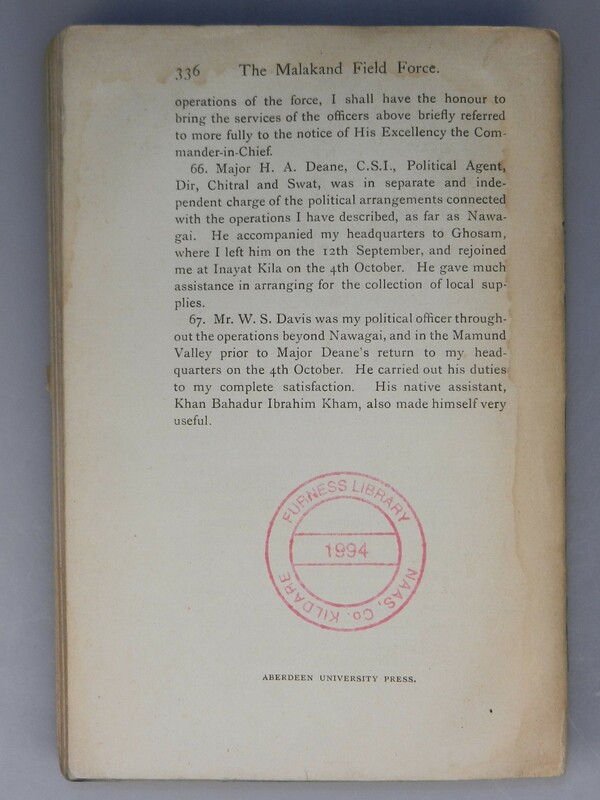 But we make exceptions when the copy happens to be a previously unknown issue of a first edition of Churchill’s first book. We even get excited. Recently, we were privileged to discover a previously unknown issue of a first edition of The Story of the Malakand Field Force. Specifically, we discovered that there is a wraps issue of the Canadian first edition, previously unknown to both bibliographers and the Churchill collecting community. The first edition that many of us know well – the British Home Issue – is bound in medium green cloth with gilt stamped spine print, spine title box horizontally framed with gilt rules, and a blind stamped title box on the upper right front cover with gilt stamped title within. With only a few more than 1,900 copies bound, this first edition of Churchill’s first book is both elusive and desirable. 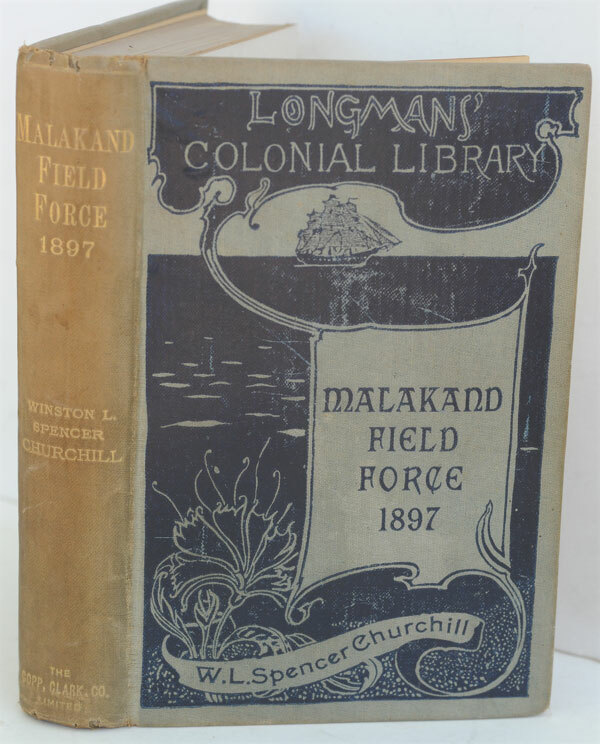 Moreover, it is one of the few Churchill books that did not have a concurrent U.S. first edition. 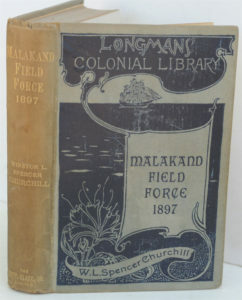 The publisher did also issue a distinctive Colonial Library issue concurrent with the first edition. These were bound both in paper wraps (for understandable reasons, few examples of the wraps binding survive) and in a hardcover cloth binding with the striking Longmans Colonial Library design featuring a schooner at sea filling the front cover. 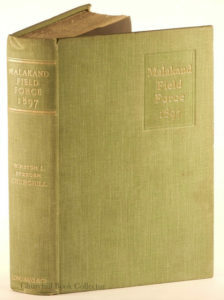 While the first edition saw only one printing, the Colonial Library issued no fewer than 10 different editions, printings, and binding variations for the very small number of Colonial issues ultimately produced from 1898 to 1901. 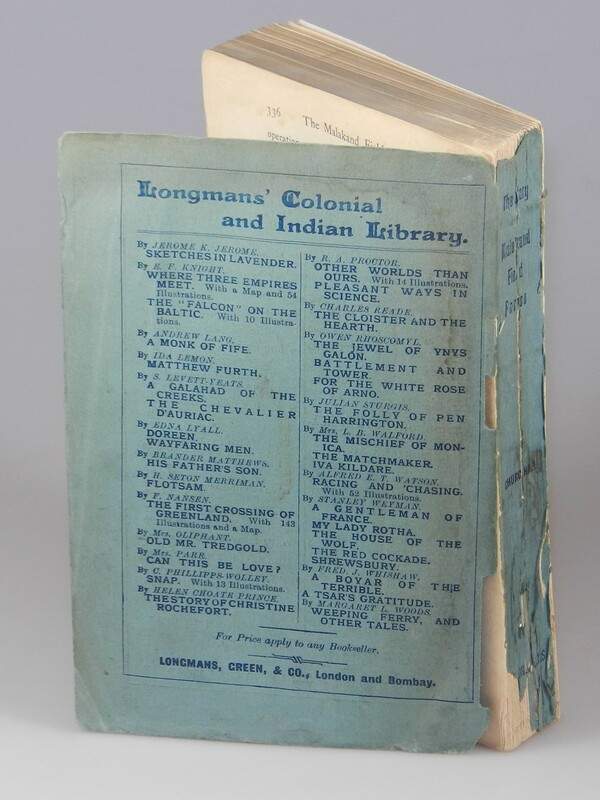 Until now, rarest of all was the Canadian issue of Colonial Library sheets, bound in a Colonial Library-style binding, differentiated by the Canadian publisher’s name on the spine and title page. Per Churchill bibliographer Ronald I. Cohen, there were no more than 250 Canadian copies issued. 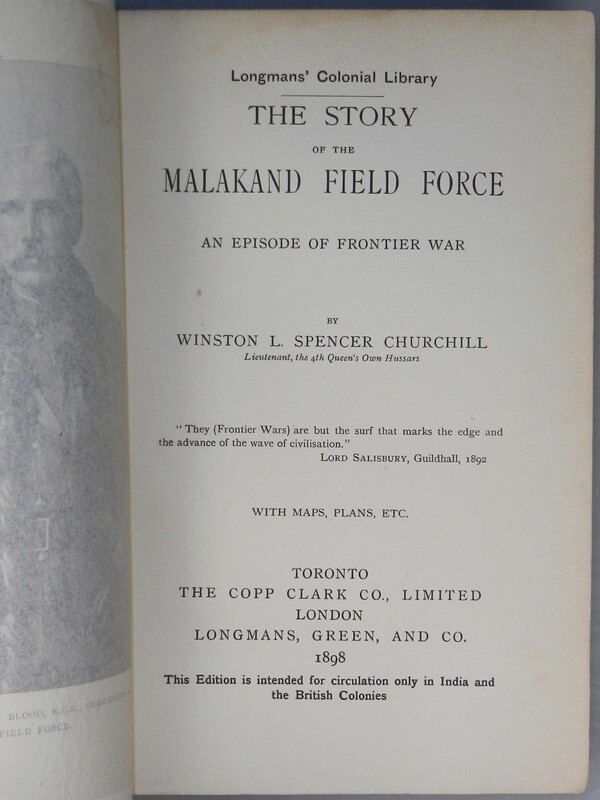 Today, these Canadian copies of The Malakand Field Force are among the scarcest books in the Churchill canon. We have seen only a small handful of copies in original bindings. What was unknown until now is that, apparently, some of these 250 Canadian copies were issued as softcover (“wraps) issues. 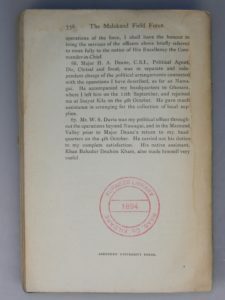 Like its hardcover counterpart, this only known surviving copy of the wraps Canadian issue has a title page cancellans bearing the Canadian publisher’s name. Perhaps even more improbable than its survival is this copy’s Irish provenance. The final page of text bears the circular ink stamp of a library in Nass, County Kildare and is dated 1994. 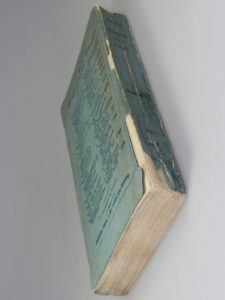 In contrast to its hardcover Canadian counterpart, the wraps issue features the British publisher’s name on the spine. 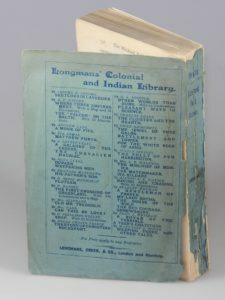 The rear cover – both the recto and verso – seem to have content identical to that of the wraps colonial edition. Alas, this singular Canadian wraps issue lacks the front cover, so a further bibliographic mystery waits to be discovered. In interviews, I’ve often been asked “What’s your favorite book that you’ve offered?” My usual answer is “My favorite is never one we’ve already offered, but one we have not seen yet.” So here’s my newest favorite. Churchill is one of the most studied figures of the twentieth century. His official biography is the Guinness record holder for world’s longest. Ron Cohen’s three-volume bibliography of Churchill’s works is among the most thorough and exhaustive bibliographies we have seen for any author. So popular and well-known is Churchill that there is even a bookseller (albeit of questionable sanity) that makes a business of specializing in works by and about him. And yet there are still new things to discover. Even about Churchill’s first book. So – good hunting and happy reading!